1 Wash the potatoes well and cut a cross half way through one side of each potato. Season lightly with salt and wrap in aluminium foil. Place the foil-wrapped potatoes on a baking tray and bake in a preheated oven (200°C | 400F | gas 6) for 30-40 minutes. 2 Drain the beans. Heat the oil in a small pan, add the beans and heat slowly over a low heat. Mix the tomato puree with 3-4 tbsp water and the ketchup. Add to the beans, heat through and season with chilli powder. 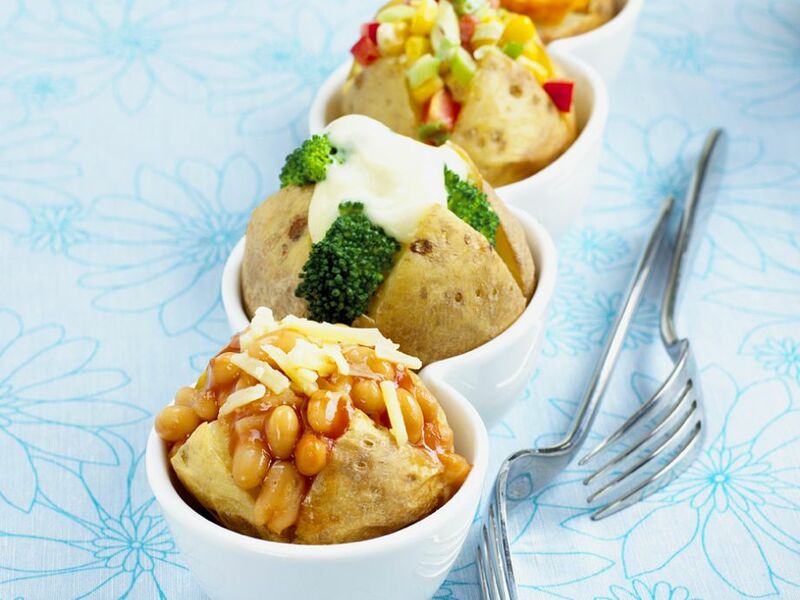 3 Fill 4 baked potatoes with the bean topping and serve sprinkled with cheese. 4 For the broccoli topping blanch the broccoli florets in boiling, salted water for 6-8 minutes, refresh in ice-cold water and drain well. Finely dice the Camembert and puree finely with the sour cream. Season with salt and pepper. 5 Put one broccoli floret in each potato and add a spoonful of the sour cream mixture to each. Serve hot. 6 For the Mexican topping drain the sweetcorn well. Wash, trim, halve, and deseed the pepper, remove the white inner ribs and dice the flesh very finely. Trim and finely chop the spring onion. Mix all these ingredients and dress with oil and vinegar. Season with pepper. 7 Fill 4 potatoes with the topping and serve hot. 8 For the Sweetcorn and Cheddar topping drain the sweetcorn well and put into a bowl. Add the rest of the ingredients and puree. 9 Fill 4 potatoes with the topping and put into the oven (200°C top shelf) for 5 minutes to brown.